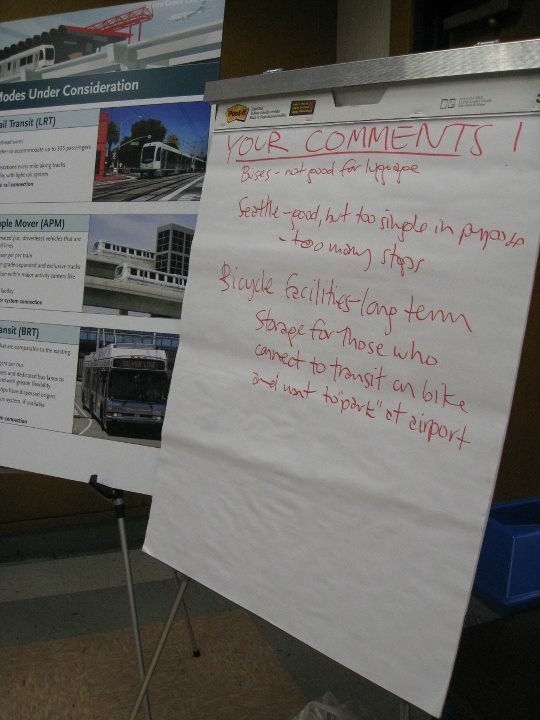 Green Line to LAX Community Workshops solicited comments from attendees. Yesterday was the last of the first round of community workshops for the the Green Line to LAX extension. According to the project team over 200 people attended the three workshops to learn more about the project and offer their input on how best to connect the Green Line to the airport. If you weren’t able to attend the meetings, fear not, you can still share your feedback with the project team. First, I recommend getting some background information on the project. This can be found on the project page on Metro.net, the project’s Facebook page or right here on The Source. Once you’ve done that there are a number of methods to share your input. First is the LAX User Questionnaire, a 16-question survey about how you currently get to LAX and how you’d prefer to get to LAX. Another option is to use this online comment/feedback form to email the project team specific comments. Comments are requested by October 1, 2011.